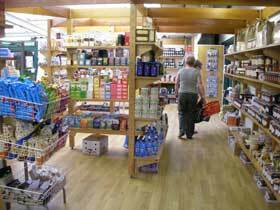 Since we got the allotment in June, Dad and I have been regularly visiting our local garden centre, an 8-acre concern on the outskirts of town. We aren’t about to stop now because of a bit of snow. It may be too chilly for real gardening but imaginary gardening goes on regardless. That said, we rarely buy any actual gardening items. Dad won’t pay. As for me, hearing ‘what kind of idiot pays these prices?’ at regular intervals takes the bloom off the shopping experience. 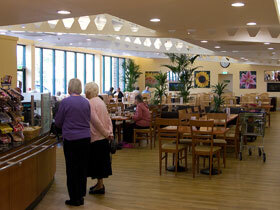 We can still spend three hours at the garden centre though, wandering around looking at things, going into the cafe for coffee and a mince pie at the beginning, then tea and a turkey ‘n’ cranberry sarnie at the end. We aren’t the only ones. The place is heaving with people, mostly over 75. Why not? It’s warm, has toilets and you can walk miles with no snow underfoot, looking at the nice plants and supporting yourself on a trolley. There’s no stigma attached (unlike a day care centre) and it’s free (unlike a National Trust property). At this time of year, the emphasis is less on gardening, more on giant pot pourri, ‘Meditainment’ CDs and hexagonal jars of honey. One room is entirely dedicated to Christmas lights. Bulbs, icicles and candles of every colour shimmer, twinkle and flick on and off in complex sequences while a huge illuminated Father Christmas in a sleigh goes back and forth, waving. You’d hope he might be reduced by now, but no. ‘Would anyone actually pay for a monstrosity like that?’ asks Dad. An idiot glove wearer myself, I wince. But it’s true: everything here is overpriced. I don’t think real gardeners shop here, paying over the odds for concrete horses’ heads and Big Drippa Mini Automatic Watering Systems (for watering tomatoes in gro-bags, in case you’re wondering). Who needs a Chiminea Rain Cover? And if you do need one, what’s wrong with a black bin liner? The garden centre is really a temple to shopping, not gardening. In the supermarket afterwards, he insists on paying for everything in my basket. Knowing how he feels about extravagance, I curtail my normal shopping habits. I’ll have to go back for a proper shop later. Complicated things, families. But it isn’t just being ripped off that Dad objects to. It’s the sense that everything conspires these days to make people soft. Just before we leave, I grab four packets of Ibuprofen. At times, I share Dad’s sense of a world gone mad. But there’s something to be said for going with the flow, too. Later, I pop back to the garden centre. I linger by the Big Drippa, thinking it might be useful when we go on holiday, if the neighbours happen to be away at the same time. My sights are set on something I saw earlier: multicoloured lights powered by a tiny solar panel. If those aren’t frivolous and a waste of £14.99, I’d like to know what is. But whatever Dad says, once he sees them in situ he’s going to love them. I love those lights; and the light that is this blog. Long may it twinkle. £14.99 wasted, but magnificently wasted! C’est magnifique, mais ce n’est pas le jardin. Well done again Mandy, have a great Christmas. 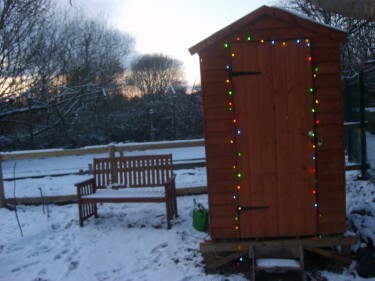 Who could fail to be charmed by a shed on stilts with its very own set of eco-friendly fairy lights? Now THAT is what I call a shed – you could even leave them on all year to deter vandals – tell your Dad that £14.99 is a very cheap security light !!! Awwwww… sweet. Happy, merry, many happy returns. If your going to waste money Mandy you may as well do it in style, love the lights. You are a woman after my own heart. Bringing a bit of light into the world! What a great way to waste money. Love your Reluctant Gardner. Looking forward to the next instalment. Whatever you do, Mandy. Do not go through that door while the lights are flashing. I think I know that place – a couple of acres of chinese pots. Impassive checkout ladies. Big visa bills. Hope your lights don’t lure aircraft heading for Yeadon. Thanks Mandy. hope you had a good Christmas. Has you dad got any good ideas for turkey leftovers, so as not to waste them? Just love your analysis of the pleasures of garden centres over day centres and the National Trust. I always find then a strange combination of repellent and difficult to leave. Hope you’ re having a good holiday and also planning/ living your next episode. Lovely to see you the other day. It will soon be time to have open days on your allotment – can’t wait! And what about poetry readings … art and craft displays… ? Lovely Christmas version Mandy. I know a lot of men (not so old as your Dad) with similar money sentiments. Keep going with the gardening and your Dad. Hi everyone. Thanks for your great comments, that I always love receiving. Jo: stew, stew and more stew (as long as it doesn’t involve turnips). Janis: dead right about that strange repel/attract dynamic. Wierd, intit. Jan: open days, whatever next? Perhaps the Red Arrows could do a fly past. Kate: your local garden centre had a Santa? They obviously know how to do things properly down South. Sylvie: who are these men? Mr MS (unbankrolled generosity personified) could do with meeting them. Rebecca: that’s really lovely. Thanks. Bodhipaksa, looby, Kathy, Sue and Joy: your glorious attitude to spendthriftery encourages me no end! Pete: you learned person, you – I had to look that reference up. C’est manifique mais ce n’est pas le way we speak up here in Yorkshire. Helen: thanks for bringing the eco-friendly angle in. Exactly! Jim: I won’t. I don’t want to end up in the space/time continuum of some far distant galaxy.